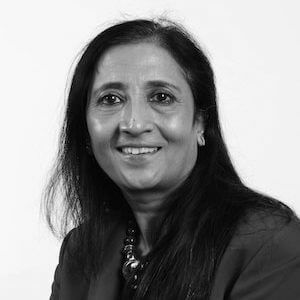 Bhavini has built our Consultancy directorate (incorporating NHS England’s specialist and niche service provider Commissioning Excellence) to enable our clients to have meaningful dialogue with their NHS customers. She is passionate about making customers’ needs a priority whilst ensuring the ultimate goals are better service provision for the NHS and improved outcomes for patients. A successful senior international sales and service expert, Bhavini joined Wilmington Healthcare in 2016 after 26 years at IMS Health (now IQVIA) in 2016. During her time at IMS, Bhavini held multiple positions including Global Account Director, Global Client Engagement Director and Global International Sales Director (North Europe and Africa). Prior to joining IMS Health, Bhavini worked for GlaxoSmithKline as a Senior Technical Officer conducting experimental work for new drug formulations and at Northwick Park Institute for Medical Research as a Clinical Research Associate working with cardiologists on Phase IV/V clinical trials.